If you're in the market to buy a garbage disposal, you probably have a few questions. Most homes today come with a disposal already in place, but that's not the case for many older homes. Whether you need to replace an existing garbage disposal or install one for the first time, this buyers guide will help you sort thru all the sales hype so you can find the right one to meet your needs. You'll have the knowledge to confidently start your shopping experience, and in fact, you may even know more than the sales person! Garbage disposals are a wonderful convenience. Some municipalities encourage the use of garbage disposals because of the potential health benefits they offer. This is largely because they can help prevent the spread of disease. When food is ground up and sent down the drain, it'll decompose faster than when its sent to the landfill. Making garbage disposals environmentally friendly, and justifying the necessity of using a bit more electricity and water. Before starting to look for your new garbage disposal, there are a few questions you should ask yourself. Before you start shopping, it's always a good idea to have a budget in mind. 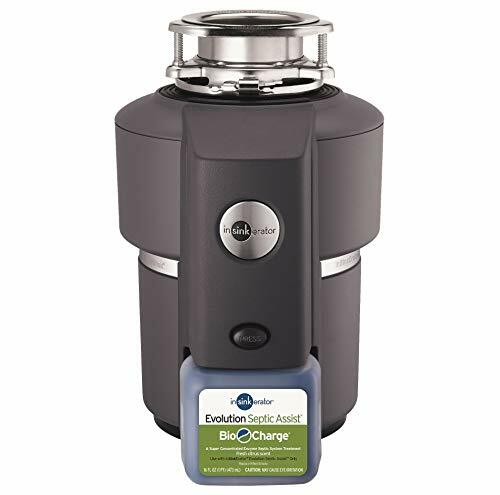 When you start learning about all the bells and whistles, it's easy to purchase a garbage disposal with more features than you need, and thus, spend a lot more money than necessary. An inexpensive disposal can be purchased for well under $100. These types of garbage disposals typically either come with a 1/3 hp or 1/2 hp motor. Although they're designed for light use, they can be very handy. Top of the line disposals are often over $300. These units have powerful motors, anti-jamming features, and solid multi-year warranties. When you purchase the more expensive units, you can expect them to have a longer service life and thus, save you money in the long run. Is My Home's Plumbing Able to Handle a Garbage Disposal? If you own an older home, you may be concerned about your home's plumbing having the ability to handle the extra waste water. That could be an issue if your home already has drainage problems. Fortunately, the size of drain pipes used in today's homes is essentially the same as it was 100 years ago. So for this reason, if you're not having drainage issues, your plumbing should be able to handle a garbage disposal. Can My Septic System Handle a Garbage Disposal? Many people worry that a garbage disposal shouldn't be used if they're on a septic system. This is not necessarily true, although there is quite a bit of information on both sides of the argument. The bigger question you should ask is, whether or not your septic system is able to handle the extra work load. In most cases, septic systems have two - 500 gallon tanks. The size of the drain field (also known as the leach field) is determined by the number of bathrooms within your home. When a septic system fails, its generally due to a problem coming from the drain field. If a garbage disposal wasn't planned for when the septic system was installed, the drain field may not be large enough to handle the added waste. The septic tanks themselves are usually not a problem, although you may find that they'll need to be emptied more frequently. But if you notice, especially after it rains, that the system drains slowly, your drain field is likely overwhelmed. We recommend checking with your local water authority or the building permit department if you're on a septic system and you don't currently have a garbage disposal. The biggest problem that garbage disposals cause for septic systems is the increased amount of solids the bacteria needs to break down. There are "septic assist" garbage disposals available that are designed specifically to be used with septic tanks. These disposals have an injector which automatically shoots a citrus scented micro-organism concentrate into your drain. The micro-organism concentrate assists the bacteria that's already within the tank. Thus, eliminately the normal problem of using a garbage disposal with a septic tank. InSinkErator makes a garbage disposal that's specifically designed to be used with septic systems. Is a Garbage Disposal Permitted in My Area? Some municipalities may not allow garbage disposals, or in some cases require a permit to install one in your home. This is more likely to occur if you live in an area that has chronic water shortages, or if the city's water treatment plant is near capacity. Contact your municipal water authority if you're unsure if they are allowed in your area. If a permit is required, it will most likely be issued thru them as well. Do I Have The Necessary Hook-ups? There's a huge difference between replacing an existing garbage disposal and installing one to a sink that doesn't already have one in place. Not only is there the necessity of changing the sink's drain lines to accommodate the garbage disposal, but there's a good chance you'll need to wire the area for electricity. Adding the necessary electrical power hookups can be complicated and should be done by a professional unless you know what you're doing and you're comfortable working with electricity. However, don't automatically assume that there isn't electrical hookups in place just because you don't have a garbage disposal installed. Your kitchen may have been wired for the disposal, but for whatever reason, it may not have been installed. Check under the sink to see if there's an outlet or an electrical box. Also, check above your counter for a power switch that doesn't operate anything else. You may have just solved the mystery of why that switch was there! Will I have Enough Space Under My Kitchen Sink? Unless you already have a garbage disposal, you're going to lose some storage space under your sink. As a general rule of thumb, the more powerful disposals tend to take up more space. You can also expect them to be heavier too. InSinkErator's top of the line model, the Evolution Excel, has a 1 hp motor and weighs-in at 23 pounds. For all it has to offer, it's incredibly streamlined. However, when every inch matters, the Badger 5XP is significantly smaller in width, and only weighs 15 pounds. Yet, it still packs a 3/4 hp motor. How Will I Use My Garbage Disposal? How your family eats can affect your choice in garbage disposals as well. The amount of food and the types of food, are your main concern. If you'll be putting a lot of bones down the drain, especially beef bones, then you should consider purchasing a disposal with a larger motor. Read this article to help you determine the correct size motor to purchase. Garbage disposals are actually fairly easy to install, especially if you are simply swapping a new unit out for the old one. If you're a DYI'er with a few common tools, this is a pretty straight forward project that you'll most likely be able to handle. However, if you'll need to make plumbing and electrical adjustments, it's probably not a bad idea to contact a professional. The decision to do the job yourself really lies in your comfort level. This article will show you step-by-step how to install a garbage disposal. There are 2 basic types of garbage disposals on the market today. Although, they both accomplish the same basic task of grinding food waste, there's one main difference between them. But first, let's take a look at how a garbage disposal works. Many people think there's knives swirling around within the grinding chamber. But in reality, the food is "thrown" against the sides where its broken down into small particles. This video will show you what happens inside the disposal. The 2 types of garbage disposals are continuous feed and batch feed. Let's take a closer look at each. Continuous feed disposals are the most common garbage disposal on the market. They are easy to identify because they need to be turned on by an electrical switch before they'll begin to grind. As food waste is placed inside the disposal, a stream of water is used to flush the ground food down the drain. A continuous feed disposal can either be hard-wired into the home's electrical wiring, or a power cord can be purchased, and the unit can be plugged into an electrical wall socket. Since a continuous feed garbage disposal operates whenever the power is switched on, they are more dangerous than batch feed disposals. Items such as silverware or jewelry could easily slip into the grinding chamber of a continuous feed disposal while the unit is powered on. Without even thinking, the user may reach inside to recover the item, and a significant injury could be the end result. Batch feed garbage disposals may be safer, but they're frequently more expensive. Many users are more than willing to pay a little more for the additional safety they provide. A batch feed disposal won't operate until a special stopper is put in place. The stopper activates a switch which allows the unit to begin grinding the food waste within the grind chamber. There's no risk of injury when operating this type of disposal because the unit won't begin to grind without the stopper. Since a hand can not be put down the drain when the stopper is in place, any recovery of items will require the disposal to be off. In most cases, if you purchase a quality garbage disposal, you can expect it to last about 10 to 12 years. So, taking the time to make sure you find a model that meets your needs is time well spent. Motor size is often the biggest single consideration when selecting a garbage disposal. Horsepower is used to rate the power of a motor, and the four basic sizes of a home disposal are: 1/3 hp; 1/2 hp; 3/4 hp and 1 hp. Generally speaking, a 1/3 hp motor is the least expensive disposal on the market. Unfortunately, they are seldom powerful enough for home use and are plagued with jams and other issues. A 1/2 hp motor is better suited in tackling food waste. However, many plumbers recommend purchasing the larger 3/4 hp motor. The extra money you pay up front for the larger motor will typically increase the service life of the disposal, and reduce the likelihood of jams. The 3/4 hp and 1 hp motors can typically handle your grinding needs without too much worry. However, even garbage disposals need to be treated with respect. Selecting a disposal with a larger motor means that the food waste enters the drain lines in smaller particles. When large chunks of food are within the drain lines, the chances for a clog developing are greatly increased. We have a more thorough article on this topic available HERE. Although, selecting the right motor size is important, the materials used within the grinding chamber are vital. These materials will play a big role in how your garbage disposal ages. In fact, it could be argued, that the materials used in the construction of the grinding chamber should play the biggest role in your buying decision. When you consider that the grinding chamber will frequently be drenched in garbage and water, and then left to air dry, the materials used will need to be hardy. Simply put, lower quality materials won't be able to handle the abuse. They'll corrode and force you to purchase a new garbage disposer sooner than you'd like. In theory, a garbage disposal is basically capable of running forever. Well, that is, if the right materials are used for the components within the grinding chamber and the chamber itself. Since the motor is actually only running for a short amount of time, sometimes only seconds, it could take decades to wear out the motor's bearings and/or other parts. So, spending a little more money to purchase the right grinding chamber materials is an excellent decision that will pay off in the years to come. Durability is your number one concern when it comes to the materials used within the grinding chamber. Your best choice is to select a disposal that's designed so that all the parts that come into contact with water are either made of stainless steel or plastic. But we're getting ahead of our self. Let's take a look at some of the popular materials used within grinding chambers. Stainless steel is the gold standard. The odds are definitely in your favor that your garbage disposal will outlast the motor bearings when stainless steel is used. You'll spend a little more money initially, but there's a good chance that you'll never need to replace your disposal. Plastic has it's advantages, especially if the parts are properly designed. Since plastic won't corrode, the parts should last a long time. However, plastic will dry out and crack over time, but since the components won't be in the sunlight, your disposal should be able to give you years of trouble-free service. The galvanized protection that's applied to galvanized steel begins to chip away the minute you start using your garbage disposal. Within the first few months, any parts made with galvanized steel will be covered with rust. It's unlikely your garbage disposal will last more than a few years before the components within the grind chamber completely fail due to rusting. Parts made of pot metal are frequently painted or plated. This is because, if they are left bare, they'll rapidly become covered in a white powdery corrosion. As the components within the grinding chamber age, the paint or plating begins to blister and chip away due to corrosion. The parts generally look pretty bad, but surprisingly, they often last for decades since they can be manufactured quite thick. Garbage disposals are typically wired in one of two ways. Either they are hard wired, which is very common, or a power cord is used to plug the disposal into a standard 120 volt AC electrical outlet. When purchasing your new garbage disposal, you'll want to match your home's wiring. If it doesn't match, you should hire a professional to change the electrical configuration. The other electrical concern is the power switch that's needed to operate a continuous feed garbage disposal (batch feed disposals don't have this requirement). If your home doesn't already have a power switch (standard light switch) for a garbage disposal, an electrical outlet box can be installed under the sink, and/or a countertop air pressure switch can be installed. This video will show you how to install an air pressure switch. Garbage disposals can be noisy appliances. As a general rule, the higher-end, more powerful disposals are better insulated and are often designed with other sound muffling features. Read our full article on buying a quiet garbage disposal. How the garbage disposal attaches to your sink is called the mounting system. There are two types of mounting systems that are commonly used. Each type has its advantages. Both the EZ Mount and the 3-Bolt Mount are relatively easy to install, although there are a few additional steps with the 3-Bolt Mount. Its often a good decision to simply use the same type of mounting bracket that your old disposal used. This generally makes the installation easier. Although, many people feel more comfortable with the 3-Bolt Mount because it's made from stainless steel. However, if you're drawn to the easy-to-clean removable splash guard, you're best choice is the EZ-Mount. Regardless of which mount you choose, the performance of your garbage disposal won't be impacted. If you're replacing an existing garbage disposal, there's a good chance that it was installed with a 3-Bolt Mount since most homes used this mount over the last 50 years. The EZ Mount is designed by Waste King and uses a locking collar that allows you to twist the new disposal into place. InSinkErator manufactures it's own version, called the Quick Lock. One of the nicer options included on some of the higher-end models is the anti-jam features. All garbage disposals have a tendency to jam, especially when too much food is placed within the grinding chamber, or hard foods, such as bones are ground. But some disposals are designed with features such as automatic reverse and jam sensor circuitry that senses when the motor begins to bog down and adjusts the torque to bust thru the jam. Frequently, you'll never even realize a problem was looming. Garbage disposal warranties can vary significantly between manufacturers, and even between models from the same manufacturer. For example, the Evolution Excel is the flagship model from InSinkErator, and the company offers a generous 7-year warranty. Yet the Evolution Compact, which is in the same product line-up, only has a 4-year warranty. You may wonder why the same reputable company would offer different warranty lengths. The answer falls into two parts. First, you'll always pay for a longer warranty. This is because the manufacturer calculates the projected cost of repair or replacement for the unit and adds it into the selling price. Also, the longer warranty is an indication that the manufacturer has a high level of confidence in the materials and workmanship. The company is basically telling you that the disposal is less likely to have problems. As with any appliance purchase, it's important to select a brand with a good reputation for quality, longevity and customer service. Major brands become major brands because they sell a lot of units; and they sell a lot of units because they manufacture quality products. There are a couple of major players in the garbage disposal world. InSinkErator is probably the best known. The company was founded in Wisconsin by an architect named John W. Hammes. In 1927, Hammes invented the very first garbage disposal for his wife. InSinkErator also manufactures the very popular Badger series, which offers a quality product at an economical price. Waste King is another major player in the field. The company has been around for over 50-years and manufacturers powerful disposals. Some their products even have a 20-year warranty!